The SeaWorld Orlando Aviculture Team recently welcomed two new additions to their family – a Caribbean flamingo and a tawny frogmouth chick. The flamingo chick hatched on August 16, weighing just a pound. Although today it stands about 18 inches tall and weighs three pounds, when fully grown it will be five feet tall and double its weight. Its characteristic pink feathers start developing at three months, but the chick won’t gain its full color until it’s about three years old. Flamingos’ bright pink feathers come from the carotenoid pigments they consume as part of the crustaceans found in their diet. 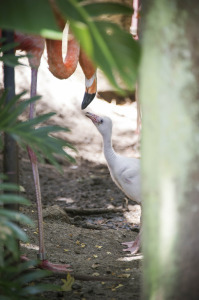 Guests can see the chick with its parents in the flamingo habitat located near Manta. Did you know that both flamingo parents share feeding responsibilities? The chick is fed crop milk that comes from the parents’ upper digestive tract. As the parents feed the chick, they actually lose their pink color – and their feathers turn a pale pink or even white. Their color is regained as the chicks become more independent. Caribbean flamingos, native to South America and the Caribbean, are by far the brightest and one of the largest of all the flamingos. A tawny frogmouth chick also recently hatched at SeaWorld Orlando on August 23. 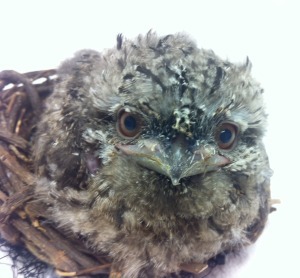 Much smaller than a flamingo chick, the tawny frogmouth weighed just 9 grams (.3 ounces) when it hatched. Now a month old, the chick weighs 160 grams (5.6 ounces) and will grow to weigh as much as 600 grams (1.3 pounds). The chick is being hand raised by the SeaWorld Aviculture Team because its parents are first time layers and weren’t sitting on the egg correctly. Caring for the chick is a 24-hour job just as any newborn. For the first three weeks of its life, he went home nightly with the aviculturist for round-the-clock feedings and close monitoring. Tawny frogmouths are native to Australia and are known for their enormous, wide, frog-like mouths used to capture insects, but are often mistaken for owls. SeaWorld Orlando is a leader in the care of flamingos and tawny frogmouths and a major contributor to global programs and flamingo husbandry research. SeaWorld Aviculturists have participated in many of these research projects such as the Wildlife Research Expedition in Coastal Yucatán, Mexico and the Caribbean Flamingo Banding Expedition at Great Inagua National Park in the Bahamas. SeaWorld Orlando partners with several members of the Association of Zoos and Aquariums dedicated to the future success of the species. This entry was posted in Home Page, Home Page Slider, News and tagged SeaWorld Orlando. Bookmark the permalink.